I recently did a shoulder workshop and thought I would share what we covered on here as well. 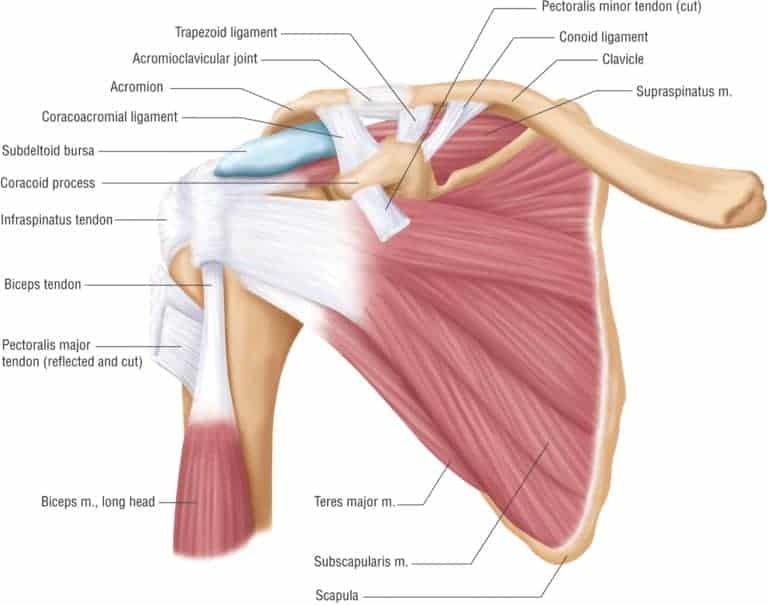 The shoulder is a relatively sensitive joint, because of the many motions it is capable of. There are many tendons and structures within the joint that can be the root of shoulder pain including: rotator cuff muscles (supraspinatus, subscapularis, infraspinatus, and teres minor), biceps tendon, and ligaments attaching bony structures. As you can see in the image above, it’s a complex structure. Add to that the many movements we can use our arm for – internal and external rotation, reaching overhead, lifting items in front of us, reaching behind us, etc. it becomes very complicated. The best thing we can do for our shoulders to protect that joint is make sure we are using good posture. Ideally, that means locking the shoulder down into a good position and then doing movements from that safe protected position. Whether it’s weight lifting, lifting a pencil, or pushing something overhead, we want to maintain that locked and supported position of the shoulder. In the photos above, you can see her shoulders are being drawn down her back and pulled towards her spine slightly, her hands are in external rotation (palms facing forwards). There is no forward shoulder roll, her chin is not poking out. From this position, you can safely use your shoulder and allow those tendons to glide and slide in the joint with minimal wear and tear on them. This is an exaggerated form to show proper shoulder positioning, but from here you can reach and lift safely. Another way to think about it is drawing your elbows down towards your hip, with a slight squeeze between the shoulder blades. Go practice that in a mirror and see if you can feel or see a difference in good positioning vs. bad positioning.